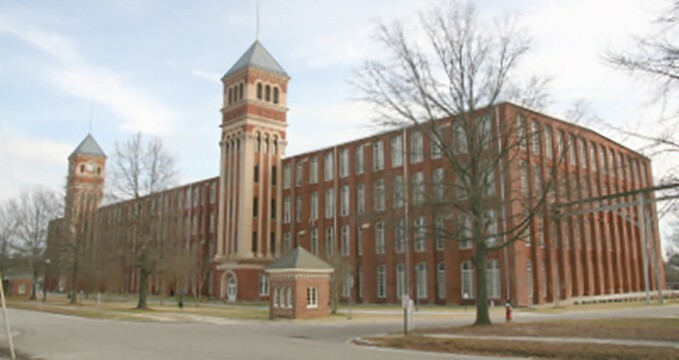 The Olympia Cotton Mills in Columbia, South Carolina has recently been rehabiliated into market-rate residential units along with the nearby Granby Mills, at an estimated total cost of $30 million. Powers & Company, Inc. successfully nominated the building to the National Register of Historic Places in 2004 and is presently guiding the project through the Federal Historic Preservation Tax Incentive process to assist in the overall financing of the rehabilitation. For the rehabilitation, new windows were manufactured based on one existing window set. The pre-rehabilitation interior of Olympia Mills was open in plan with an exposed wood post and beam structural system of longleaf pine with massive, regularly-spaced wood columns and tongue-and-groove wood flooring. On each floor, a new central, double- loaded corridor was created leaving the wood columns fully exposed. Within these wide corridors, lounge seating was included for the enjoyment of the tenants. The units incorporated the full height of each floor in the main living area and lofts were created in the rear of each unit to maximize the vertical space. Olympia Cotton Mills is a reminder of the strength of South Carolina’s textile industry more than a hundred years ago. The 354,544 square foot, Romanesque style building was designed in 1899 by W.B. Smith Whaley & Company a significant architecture/engineering firm of textile mill buildings.